O ye who believe! Stand out firmly for Allāh, as witnesses to fair dealing, and let not the hatred of others to you make you swerve to wrong and depart from justice. Be just: that is next to piety. And fear Allāh, for Allāh is well-acquainted with all that ye do. In the iconic image, Lady Justice holds in her half-raised left hand a pair of scales, so as to weigh the evidence led by the contending parties before the court. The Victorian concept is based on the assumption that justice is blind, that she performs her task without fear or favour, and does not go by the appearance of the parties arraigned. One may ponder the symbolism of this depiction, however. How do you see which way the scales of Justice tilt, if your eyes are blindfolded? How do you wield the sword of punishment with your eyes deliberately closed? In your blind fury for doing justice, how do you ensure you do not strike at the innocent party instead of the guilty? Furthermore, the delay involved in the process of arriving at the decision will freeze the right arm and shoulder of Lady Justice, as also her left elbow, holding aloft the sword and pair of scales. 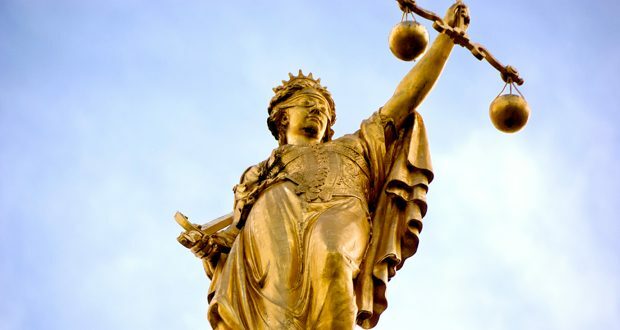 With clear eyes (and a clear head) Lady Justice would see with unbiased vision, looking intently at the ever tilting scales held in her left hand. She holds the hilt of the sword in her right hand. The tip of the sword is resting on the ground near her feet, so that her right arm and shoulder are not frozen stiff by the necessary delay involved in the trial. After considering the evidence, Lady Justice is left free to wield the word swiftly, and strike the guilty party. Being clear eyed, she cannot by mistake or accident, strike the innocent. Justice is the cardinal value of any civilized society. More than any other element, arguably it is justice which has been the cornerstone, and bedrock of all great civilisations. Without justice, the entire bulwark of society would crumble. There would be utter chaos and confusion and people would have to live in constant fear and mental distress if justice were to fade away from society. In verse after verse, the Qur’ān implores mankind not to swerve in the performance of justice. The commentators explain this verse with reference to the case of Ta’mah b. ‘Ubayriq, a Muslim of Madīna who was suspected of having stolen a shield and later planted it in the house of a Jew, where the property was found. Some Muslims sympathised with Ta’mah, but the Prophet (sallAllāhu ‘alayhi wasallam) ruled in favour of the Jew who had been falsely implicated. Mentioned in Tafsīr al-Tabari, al-Bahr al-Muhīt and others.